This pot is our translucent blue and display a beautiful pattern under the outer skin. It is the middle size of our orchid pots and is perfect for Phalaenopsis Orchids. We prefer plastic for orchids because it stays warmer than ceramic. Orchids need consistent temperature, lots of air flow, and humidity at the roots. These pots are designed with all of that in mind and are perfect for growing beautiful orchid displays. This is our mid-sized orchid pot and tray, measuring 4.5" diameter by 5" tall. 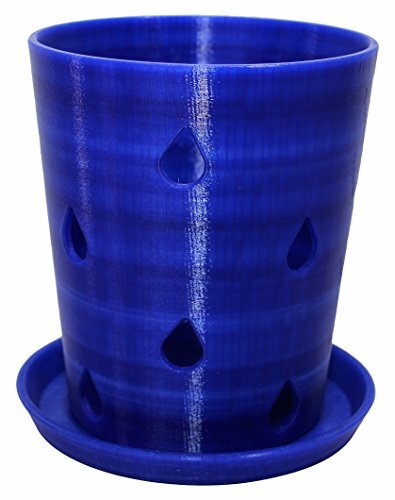 The pots have large holes to provide air to the roots and a clear view of root growth. These pots are designed to be used with orchid bark. They're made of a thick, durable, non-toxic plastic.